Announcement Welcome to Lolli & Grace, where you'll find charming and colorful embroidery patterns, delightfully-stitched hoop art, hand-painted notions and unique doll patterns. All of my embroidery and doll patterns feature clear instructions and step-by-step photographs. And if you like to hurry up and get right to the fun part, I often have project supply kits, which make it particularly easy to enjoy the process of making something beautiful and surrounding yourself with unique, handmade designs. All of these pieces make great gifts, too! I always have the next project percolating, so be sure to check back often. 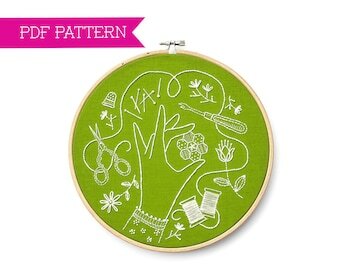 Welcome to Lolli & Grace, where you'll find charming and colorful embroidery patterns, delightfully-stitched hoop art, hand-painted notions and unique doll patterns. All of my embroidery and doll patterns feature clear instructions and step-by-step photographs. And if you like to hurry up and get right to the fun part, I often have project supply kits, which make it particularly easy to enjoy the process of making something beautiful and surrounding yourself with unique, handmade designs. All of these pieces make great gifts, too! 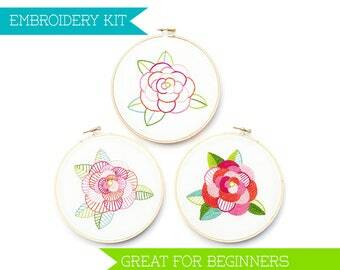 Absolutely beautiful embroidery kit! I'm thrilled with everything - the gorgeous design, the thoughtfully chosen supplies, and the detailed instructions. Such a lovely, nicely packaged kit. I can't wait to stitch this beauty! I would definitely order more for myself or to give as gifts. Speedy shipping, too, which is always appreciated. Thanks so much! Oh my gosh!! This was a beautiful project!! Thank you for such a fabulous pattern. The tutorials were perfect & easy to follow. 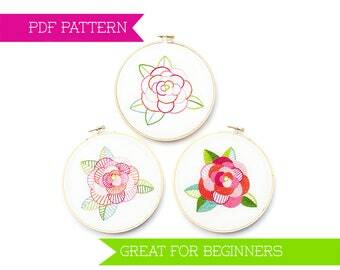 Make a mushroom hoop or make a mushroom patch - this PDF pattern will show you how to do both! Along the way, learn a fun and easy thread painting technique that will have you excited to stitch all the cute ‘shrooms! Supply kits are all stocked up for the “One Meaningful Word” design! 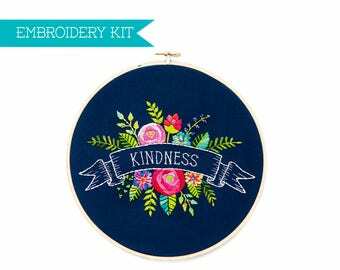 Choose from a list of 67 words and stitch a beautiful floral hoop that will inspire you not only this year, but also in years to come. The “One Meaningful Word” pattern for 2019 is now available! You can stitch any one of 67 words, and there’s even a video tutorial showing you exactly how to complete all of these flowers. 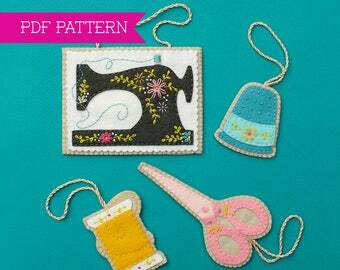 Start the year off right with some beautiful and fun stitching! Happiness and stitches, kindness and lovely things...it's a good life. Art and color and craft and beauty - all together I think they're like some sort of magic. And I'm blessed to say that magic has played a big role in my life. How, you might ask? As a child (and a shy one), my love of crafts and drawing was the key to many enduring friendships. One friend and I spent every single day for several summers drawing horses, more horses...and the occasional dog. I still have those sketchbooks. Art advocated for me (when I was too shy to speak for myself) and allowed me to take on leadership roles that gave me self-confidence and showed me how fun it was to share my talents both with good friends and people I hadn't met yet. Helping to design, draw and ultimately paint the first mural at my elementary school (yay for all things 1976 and Bicentennial!) seems like it was just yesterday. As I approached my teenage years, I took art lessons where I learned a completely different way of thinking how to put a pencil to paper to create something meaningful from a blank sheet. I also drew a self-portrait that, when I looked at it, stunned me - I had never seen myself like that. (Yes, we had mirrors in our house.) That lesson - of how a seemingly simple drawing can transform something you look at every day and make you see it with new eyes - still resonates with me today. Bonus points for the fact that the "everyday" thing I was looking at was, well, MYSELF. Along with lots of drawing, I also LOVED to do crafts. Any kind of crafts. I needlepointed in Jr. High and cross-stitched in college. When I was pregnant with my daughter, I had an almost uncontrollable urge to knit. Knit everything - knit it all! And now, it's as though I've come full circle and incorporated all of those lessons and revelations. I have the privilege of creating beautiful pieces and sharing them with you. I'm connecting with other artists and appreciating their vision of what is beautiful, I'm building friendships with people who love to create something personal and put it in their homes or to gift someone else with what I've created, and I'm finding a colorful and creative joy in this season of my life. Thank you for sharing that color and joy with me! I have one (very patient) husband, one (very amazing) daughter and (one) very happy, creative and cluttered house. When I'm not crafting, designing or stitching, I'm reading. Or waiting not very patiently for the next season of Daredevil. No refunds on custom orders. Please be sure of your order before you place it. All photographs, patterns and designs are © Lolli and Grace. Please do not copy or use my photos or designs without permission. Because copying is just plain icky. I LOVE to talk about all things crafty, stitchy and colorful, so I'm always happy to answer any questions you have. That's the beautiful thing about crafts - you can always find a friend who either loves the same stuff you do, or who can show you something new and wonderful you've never seen. That's why the crafty life is a good life. There are no refunds on PDF/e-pattern purchases. Refunds on finished items that are shipped to you will only be granted if the item has been damaged during shipping, and when the item is returned to me. If your item is damaged during shipping, please contact me as soon as possible, with a description of the damage and photos of both the item and the box in which it was shipped. I accept payment via Direct Checkout or Paypal. You may also use Etsy gift cards. Easy peasy! Shipping inside the United States for larger items in boxes (embroidery kits and finished hoops) will be via USPS Priority Mail. This includes insurance from USPS up to $50.00, as well as tracking. Shipping for small items in a padded envelope (needle minders and notions) will be via USPS 1st Class. International shipping will be via USPS Priority Mail International or 1st Class Package International Service. Buyers will be responsible for any additional costs such as duties, taxes, and customs clearance fees. Import charges can vary widely but are most commonly based on the price and type of item, package weight and dimensions, origin country, and the taxes, duties, and fees of the destination country. Lolli and Grace is unable to predict which of these fees, if any, will be applied, and I will not be able to calculate or collect these fees or taxes. I do not include a receipt in the box for shipped items. If you would like a copy of your receipt, click on the arrow under your profile photo and choose "purchases and reviews." Choose the order, and then click on "print options" in the upper right hand corner.